Selling classic titles that they found on their travels, Counter-Print began as a little side project, something they did in their spare time. 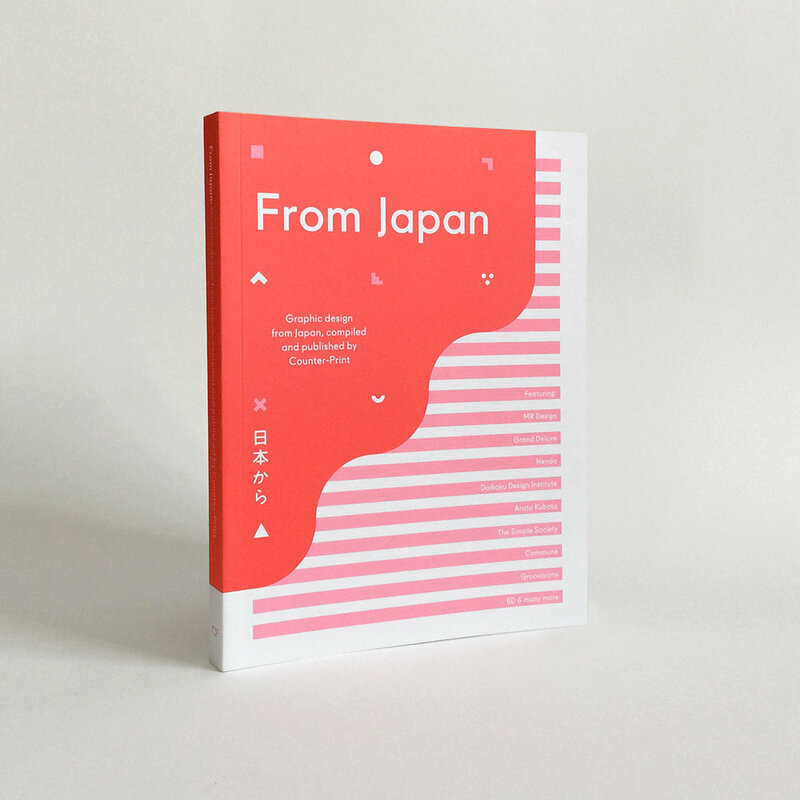 Today, the ambitious pair also offer new books on design from a variety of publishers they admire, as well as children's and lifestyle books. They even create and print their own titles, including their popular Trademarks & Symbols series. They've just launched a new website, so we thought it was a good opportunity to chat to them about Counter-Print and their future plans. Here's an extract from the interview. You can read the full story on Creative Boom. It started as a side project nine years ago, now it's a full-time venture. At what point did you ditch your jobs to focus on Counter-Print? "I think after about a year, though my memory is a little hazy, we realised that the profit we were making from Counter-Print was covering over half our mortgage. At this point, I left my full-time job and did a little freelancing a couple of days a week, gained some client’s of my own and was off. My partner jumped ship about six months later. Looking back, we agonised over it and it was our favourite point of conversation, over many a coffee, in many a café. "We still design, though not because we absolutely have to, it helps inform our work with the online store and vice versa. I’m not sure if I could run Counter-Print if I wasn’t a designer and, client work aside, there’s always the books to design." Where do you source classic design books from? "Right now we mainly buy them from online sites and antique dealers in Europe. Designers get in touch with us wanting to sell their collections, we receive books from retirees or magazines, you name it. We can also be found rummaging around your local Oxfam book shop on a Saturday morning, though with a two year old, this isn’t as common a sight as it once was." "We’ve found signed copies, beautiful inscriptions, obviously some vary rare editions, but the most exciting is when you uncover a book you know is worth an incredible amount of money. It really is extremely rare and I think it’s becoming harder to do. Perhaps sites like Counter-Print and our competitors have ourselves to blame for that. Now that so many vintage design books have been bought and sold online, it’s not that hard to find out the worth of something. "We’ve found Herb Lubalin, Milton Glaser and Lou Dorfsman books that are probably worth around £200 for a fiver. That’s a great morning." What makes a great design book, in your opinion? "Interesting original subject matter, rigorous research, a unique perspective and a design that is informed and shaped by the content are important in the creation of a good design book. I’ve published over ten books on design to date and I am very much still learning. I try to learn from the greats and often take inspiration from the books that have come through the doors of the studio over the years – this goes for concept as well as design." What challenges have you faced with self-publishing, and how did you overcome them? "So first of all, the very nature of self-publishing dictates that you are kind of on your own out there. I had a limited knowledge of the publishing business before we started. I’d designed books for large publishers and for artists at my previous job in London and I was lucky enough to work on one of the UK’s leading graphic design magazines for a year. But I felt like an enthusiast and certainly not an insider to the industry. We learnt, as so many do, by our mistakes. We started small, publishing newspapers, and then graduated to small books, gradually upping the production value as we went along. "Of course, it goes without saying, that another difficulty is money. Books cost thousands to produce, so cash flow is often a problem. We luckily seem to have plenty of ideas, so the trick is keeping the whole ball rolling, when stock, marketing, producing our own titles and so on all costs." Your business has seen the rise and fall of the e-book. You weathered the storm – are physical books more popular than ever before? "Yes and no. You can’t argue that physical publishing is enjoying the same level of success as prior to the e-book. Digital publishing has taken a huge bite out of the publishing industry’s revenue, but there is cause to be optimistic – and you should always look at the cup half full, right? "E-books have, for the first time, declined in their sales and the physical book still accounts for 80% of all books sold. The design-minded, in particular, seem to have an affinity for printed-matter, with Kickstarter campaigns funding new titles, reissues of corporate guidelines, monographs of design luminaries and newly-conceived titles on contemporary trends and fashions hitting the shelves at an heart-warmingly high rate. "I think that we are reaching a stasis, where by the sales of e-books are plateauing and the e-book will live alongside physical books, occupying a sibling rivalry and vying for our attention, as they do so." Finally, what's happening next with Counter-Print. Any hopes and dreams you care to share? "We have a large monograph in the pipeline, another book in our series on graphic design from around the world titled ‘From Scandinavia’ and a number of other logo books. I feel much calmer about my work and life than a couple of years ago. Things are going well and I’m just trying to remind myself to enjoy the process as much as possible. "When I was in my twenties it was all I wanted, just to be able to design books for a living. By sheer will, we’ve carved that living out for ourselves, by making a lot of sacrifices and working extremely hard, for as long as I can remember. Now I’m just trying to appreciate it and where we’re at. We want to do more of everything, add new product lines to the store, design books on new subject matters and create good work that we are proud of."